In a large, beautiful, comfortable manor-house in its own grounds in deep country near Szczecin, Poland, thirty-five people including staff attended a sixteen-day retreat from March 19th to April 4th, 2004 led by Peter Conradi. There were wild boar in the forest, storks flying overhead, a fabulous estate to wander in, and wood-fires in all the downstairs rooms. This was a ground-breaking program for Poland, their biggest ever by far, hosting participants from nine countries, including Ukraine, ex-Soviet Georgia, and five Danes and Swedes who got there by taking the car-ferry overnight from southern Sweden. Szczecin is wonderfully placed near the Baltic, one and a half hours from Berlin. The dedication of the Ukrainians – some of whom had hitch-hiked for days to get to a previous level in Poland – was moving and inspiring. This time they came by train, in which mafioso went from carriage to carriage demanding protection-money, which the Ukrainians did not possess. The Georgian (Temo Svirely) swam in the lake despite the snow (rather quickly) and rode, Caucasian-style, one of the fine horses that the farm manager made available to all – for free – in the break after lunch. We thanked the farm manager when he attended our closing banquet and performances. Our eggs were laid by free-range hens, and there were baby goats and a wonderful French pig to admire in the barns. The Szczecin group, led by Edyta Wankowicz, did a fabulous job preparing for the retreat, making oryoki tables, borrowing sets from Berlin and Hamburg, and making their own. Edyta did the work that at Dechen Choling would have been done by fifteen, and with good humour and a golden heart. We also had 8 days of golden silence. 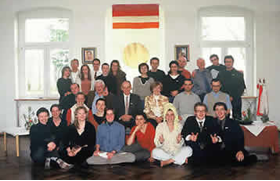 Although Levels III, IV and V were taught, the great majority (4 people – only – excepted) had already completed Level III before the retreat, and many of the Westerners had completed further Shambhala Training levels, so the number of Level V graduates at the end was 15, eight of them Polish. There were also four kasung, one Dutch (Nicolette de Hoop), three Polish – the entire complement of Polish Kasung, so it was a strong container. This was a memorable, joyous program. 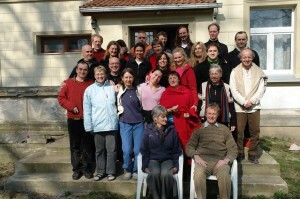 Szczecin hopes to host a whole Shambhala Training Dathun in the autumn of 2005. Shastri Peter Conradi is a distinguished writer, having written Going Buddhist which is a delight, to the biography of Iris Murdoch and the much acclaimed A Very English Hero: The Making of Frank Thompson.